One of the grand astronomical projects of the 21st Century is open for business. The Alma radio telescope facility high up in Chile's Atacama Desert has put its 16th antenna in place, giving it a configuration that allows it to do some very capable science. Eventually, it will have 66 dishes. This will give the observatory an unprecedented view of the cool Universe - all the gas and dust that goes into building stars and planets. It will also enable astronomers to see events in the very early cosmos that are beyond the detection of current technologies. "There's nothing really magical about the number 16, but the sensitivity gain on current instruments is so great it would be a shame not to start doing some serious science with Alma," said Dr John Richer, the UK Alma project scientist based at Cambridge University. Alma (Atacama Large Millimeter/submillimeter Array) is a co-operative venture that includes the scientific and engineering inputs of Europe, East Asia, North America, and the host nation, Chile. Alma's 12m-dishes and their associated receiver systems and electronics are manufactured around the world before being shipped for final integration in South America. The finished antennas are driven up on to Atacama's Chajnantor plateau by special 28-wheeled trucks, in which the drivers must sit in oxygenated cabins to cope with the thin air found at Alma's 5,000m-high location. Number 16 has the distinction of being the "first European antenna" to make it up the mountain. The 15 already in position have made some observations but these were more technical in nature, explained Professor Brian Ellison, Alma's UK Project Manager based at the STFC Rutherford Appleton Laboratory. "Those observations were early engineering checks to assess that the systems were working as expected," he said. "Obviously, as you do more science, that tends to reveal more [flaws] that engineers can go back and work on." The facility is designed to detect millimetre and submillimetre signals from the sky with multiple antennas. By combining those signals in a process known as interferometry, Alma can mimic the capabilities of a single, giant antenna with a diameter equal to the distance between the dishes. In the 16-antenna configuration this distance at its maximum separation is just 400m; when Alma is completed in 2013, the separation will be more than 15km. This will give the observatory unrivalled sensitivity and resolution. Key early targets will be the "birthing clouds" of new stars, and the discs of dusty debris that emerge around these newborns to produce planets. The European Space Agency currently operates an orbiting telescope called Herschel that has returned remarkable pictures of these same star-forming regions, but Alma will be capable of subjecting them to forensic investigation. "Herschel is making maps of big star-forming complexes," said Dr Richer. "What Alma will do is zoom in on the interesting areas and make ultra-high-resolution images that show not just a blob where the galaxies or the molecules are, but resolves in very, very fine detail the structure of those objects, whether it's the gas discs forming around stars or the collisions between galaxies at [great distance]." Alma will also go after events in the very early Universe, in particular the so-called "Epoch of Re-ionisation". This was a period about 400-plus million years after the Big Bang that saw a fundamental change in the cosmic environment - when the intense ultraviolet light from the first stars turned the dominantly neutral hydrogen gas then pervading the Universe into the diffuse intergalactic plasma we detect between the stars today. The world's astronomers have scrambled to be part of the early science observations. Almost 1,000 proposals have been submitted - far more than can be accommodated in the initial nine months of viewing time. Dr Richer is not surprised by the rush to use Alma. He is in no doubt that it will become one of the premier facilities in the front line of science. "It doesn't have quite the same profile as, say, the Large Hadron Collider and it doesn't have the same price tag," he told BBC News. 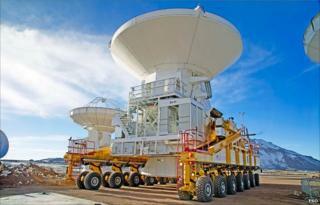 "Nonetheless, it is the most complex observatory ever constructed on the ground in terms of its engineering and scale. "We're doing this because we believe it will have commensurate scientific returns. Over the next 20 years, Alma will deliver an incredible wealth of new discoveries." Europe's participation is co-ordinated through the European Southern Observatory organisation, which runs a number of other astronomical facilities in Chile, including the nearby Very Large Telescope (VLT).